Extensively, though unwisely, used for plantations in the past, the Eurasian Pinus sylvestris is increasingly spreading into successional habitats, especially on sandy soils. First collected by Emma Cole in Kent Co. in 1893, and then again by W. Earle Mulliken in 1897, apparently as an escape, though not noted in Emma Cole's "Grand Rapids Flora" (1901). It was not collected again as an escape until C. D. Richards gathered it in Houghton Co. in 1949. Pinus sylvestris and P. banksiana are similar and young plants without female cones or mature bark can be difficult to distinguish. 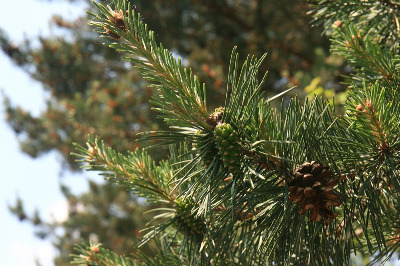 The needles of jack pine are ± abruptly obtuse to acute but blunt at the apex. In P. sylvestris the needles average a bit longer than in P. banksiana and they often tend to taper to sharp tips as well as being more silvery in aspect. In more mature trees, the curved female cones of P. banksiana tend to point forward toward the ends of their branches and are long-persistent, while the more readily deciduous female cones of P. sylvestris are horizontal or reflexed, pointing toward the base of their branches. The bark of P. sylvestris is a distinctive orange-brown, noticeable especially on the upper part of the trunk. MICHIGAN FLORA ONLINE. A. A. Reznicek, E. G. Voss, & B. S. Walters. February 2011. University of Michigan. Web. April 21, 2019. https://michiganflora.net/species.aspx?id=1926.